Spring must be here because it is time for another Jane’s Walk Weekend in the Kitchener/Waterloo area. 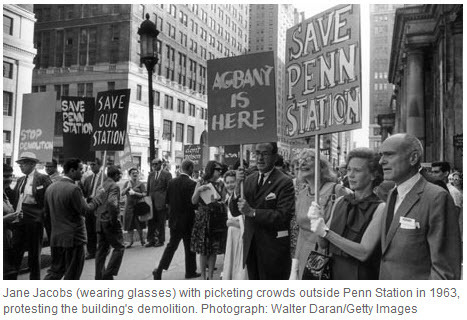 The “Jane” in the walk is Jane Jacobs who was an urban activist in the United States and Canada. She wrote books on how to build urban environments that people enjoyed living in. The photo above shows her engaged in saving Penn Station from development and in her later years she was famous for helping stop the Spadina Expressway in Toronto. Of course there are many excellent places on the web to learn about Ms. Jacobs and the great thing about the Jane’s Walk events is that you do not need to know anything about her at all, except that she serves as an inspiration for neighbours to get together and discover the history of where they live. These walks are a great way to meet people from near and far. 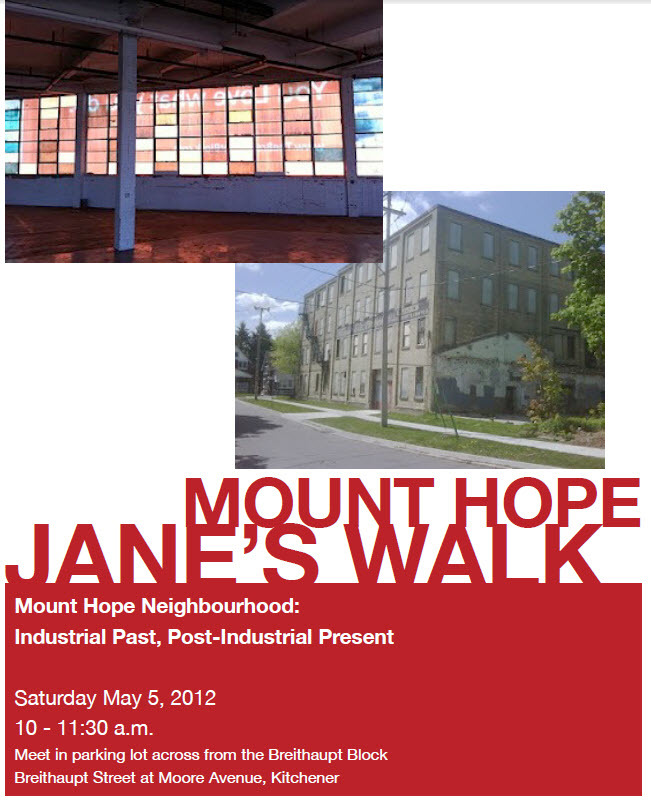 We have hosted Jane’s Walks in the Mount Hope neighbourhood in 2009, 2010 and 2011. So this will be our fourth year! On Saturday morning (May 5, 2012) we will meet at 10 am in the parking lot across from the Breithaupt Block for a walk titled: Mount Hope Neighbourhood: Industrial Past, Post-Industrial Present. Click on the image below to view the big poster. 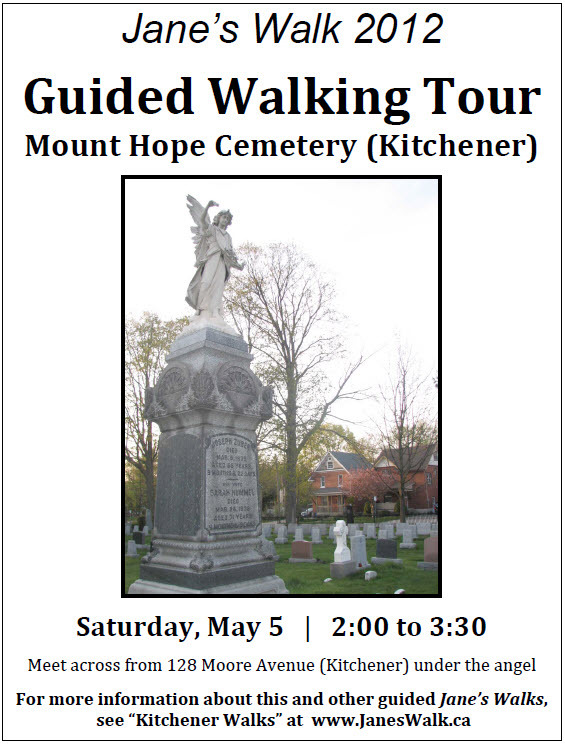 On the same afternoon we will have a second walk through the Mount Hope cemetery where Wayne will tell stories about famous people and others who were fascinating, but almost forgotten. Please come along to help rescue them from obscurity. Click on the image below to view the big poster. Please come out to one, or both of these walks. They are great opportunities to meet new friends, and renew conversations with others you have not seen much over the winter (ok, I know we barely had a winter, but you know what I mean). There are other Jane’s Walk events in the Kitchener-Waterloo area as well. For a complete list you can either go to www.janeswalk.net or click here to go directly to the Kitchener walks. At the time of this Blog posting it doesn’t look like there are any walks scheduled for Waterloo but you can check it out on the Jane’s Walk website closer to the weekend. If you look over the photos from years past you will see we get a good crowd rain or shine! It is always worthwhile to engage with neighbours and hear their stories so we hope to see you there. Bring your friends.